When one imagines amphibians (animals that live between land and water), damp, dim scenes of swamps and rainforest floors come to mind. These creatures, that can breathe through their skin and begin life swimming in form of fish-like tadpoles, must constantly have access to water to live. Given this, it’s hard to envision a frog or a salamander surviving in the desert. This ecosystem that is challenging for any species, let alone an amphibian. Largely devoid of water for months of the year, the Sonoran desert of Arizona and Mexico is infamous for its extreme temperatures and long dry spells. Yet, amphibians have found a way here in the desert, relying on the few rains a year to make a home for themselves in a seemingly uninhabitable land. Among these, the Sonoran desert toad ( Bufo alvarius) has not only has made it in the desert, but is the largest native toad in North America. So how does this toad survive the heat and drought of the desert? For most of the year, when the Sonoran desert is at its driest, the toads hibernate underground in rodent burrows under the moist earth. When toads must come out and be active, they do so only at night, to avoid the scorching sun that could desiccate their fragile skin. One might expect, then, that the toads would stay dormant underground for the summer months (when the Arizona desert can reach temperatures up to 120 degrees Fahrenheit) and would come out to breed during the cooler desert winters. However, this is not the case. Being amphibians, the toads have to sync their breeding with available water. Like those of other frogs and toads, their eggs must be laid and hatch into tadpoles in standing water, a rarity in the desert. Unbeknownst to many, the Sonoran desert receives the most rain during the hottest months of the year, during the monsoon season in July and August. The monsoon season becomes a kind of “spring” in the desert, with cacti and plants bursting into leaf and bloom with the new miraculous water. Animals go straight into breeding season with the flush of fresh resources – bugs swarm the air and bird song fills the mornings. The combined heat, water and resources help propel activity of ectotherms like reptiles and amphibians. When I was an undergraduate at the University of Arizona, I would do field work at Saguaro National Park, east of Tucson, tracking threatened Gila monsters for a conservation study. Once the rains broke in July, the night roads of the park would be crowded with Sonoran desert toads squatting on the asphalt, enjoying the puddles and searching for mates. The toads’ eyes would glint in the headlights, but they wouldn’t budge until the last second, with fat, lazy hops. Aside from my study species, Gila monsters, I found them to be one of the most charismatic desert dwellers. Sadly, I may be in the minority of people that find the Sonoran desert toads fascinating and even lovable. Because the toads are soft-bodied amphibians, without teeth or claws, they protect themselves by secreting toxins onto their skin from organs called the parotid glands. These poisons help stunt meant to poison any attempted predator. Their toxic nature has earned the toads a bad reputation in the major cities of Arizona, where urban development has spread along with man-made water sources like pools and lawns for the toads to thrive in. More toads in suburban settings has led to more toad – pet encounters, often which end poorly for the pets. Dogs that attempt to eat, or even lick, a toad begin whining, drooling, panting, ultimately leading to seizure, fever, and death (VETMED AZ). In defense of their beloved pets, many people have resorted to killing the toads on sight when they appear in their yards after the rains. Unexpectedly, the same poisons that has made the toads a threat in suburbia has garnered them an almost cultish fanbase in the world of psychoactive drugs. Along with an array of steroids and proteins, the toad’s toxins also contain 5-MeO-DMT, a chemical cousin of the popular hallucinogen, dimethyltryptamine, DMT. The toad’s poison, when “milked” from the parotid glands then smoked, apparently leads to an “incredibly intense psychedelic experience of incredibly short duration” (Most 1983). DMT, in its popular use, was referred to as the “businessman’s lunch” for this reason, offering the full hallucinogenic effects of LSD or magic mushrooms without the long-lasting trips of those alternatives. 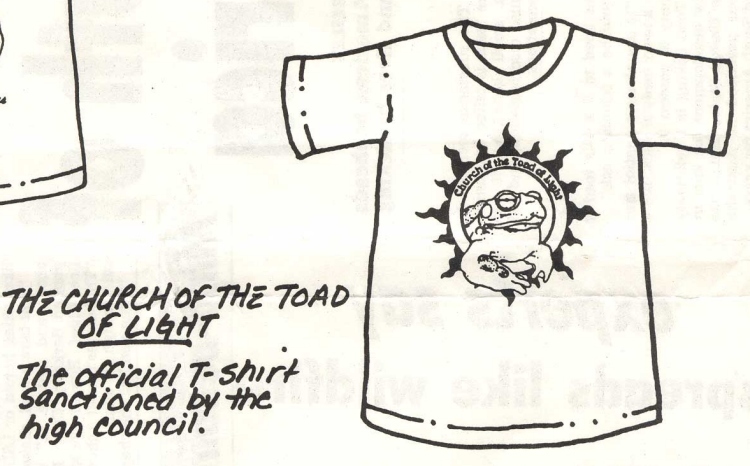 The toad’s poison, like DMT, can induce spiritual experiences, explaining the peculiar founding of the “Church of the Toad of Light”, which, while it may have not ever actually held a meeting, did sell charming T-shirts for $12 a piece. When (and why) someone was first inspired (perhaps by fairy tales?) to kiss, lick, milk, or smoke a toad, I do not know, but I imagine it would make for a fascinating story if uncovered. I, for one, recommend refraining from toad-derived psychoactive adventures, for the risks of contracting salmonella are likely not worth it, and worse: who would want to harm an adorably-ugly desert survivor like these? Next Post Field Frame Friday: Perks of studying in your “own backyard”.